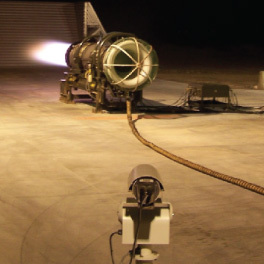 A tec, Inc. has designed and installed a variety of test cell camera systems providing remote viewing of engine test operations and facility surveillance. Our video camera systems utilize modern high resolution video camera technology with full pan/tilt/zoom capabilities, as well as options for viewing and recording/archiving the video data. We also provide smaller cameras with fixed focus. Our camera systems have often improved safety throughout test installations, allowing operators to see conditions from multiple views: Observation windows can also be eliminated, improving safety and noise concerns. Talk to our engineering staff about the advantages of our modern video systems. Often times, security personnel can activate our cameras for monitoring operation and off hours conditions. Custom designs provide any number of viewing angles within the test cell and the engine under test. 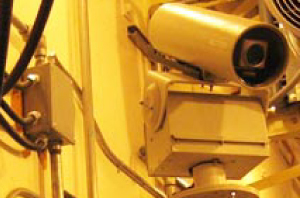 Explosion-proof camera systems for Class 1, Division 1 application. Custom video viewing options provides capability for single or multiple camera displays. Custom video data recording allows video to be captured, archived and replayed for review of post-test events. Atec’s virtual window test cell monitoring system eliminates the need for a direct test cell viewing window.